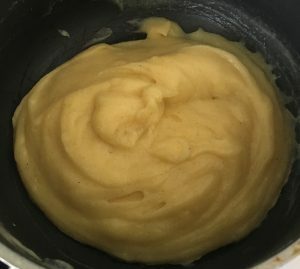 Posted on November 10, 2018 Posted in Custard	. 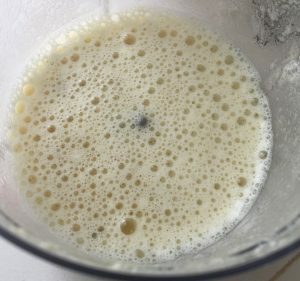 Sometimes it is quite difficult for me to write up what inspired a recipe you see on this blog, this recipe being no exception. Ultimately, I had a ton of passionfruits and wanted to make something that centered on this fruit as (a) I rarely experiment with passionfruit and (b) I cannot let food go to waste. 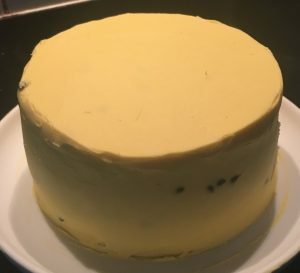 I have attempted passionfruit and chocolate cake in the past in which the end learning was that passionfruit is much better paired with a similar acidic toned profile. Orange and Pineapple both work together well, additionally they are complementary to passionfruit, not surprising that the 3 work perfectly together. 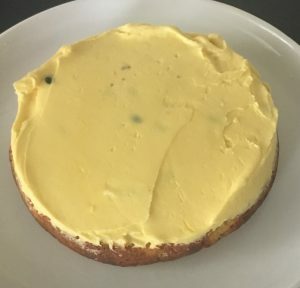 As I eluded to I have experimented with different passionfruit pairings which resulted in cakes that were not to my expectations so this time around I opted against a cake and looked at a pudding, custard and flan alternatives. The winner, that would be the custard pots. 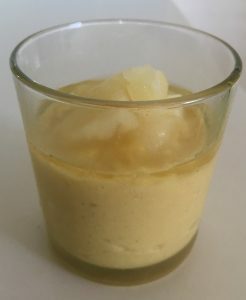 A delicious, quick and easy, low fat, lowish sugar treat. 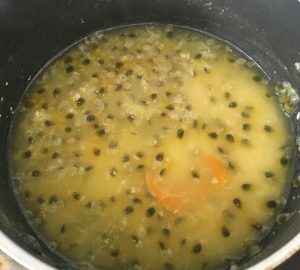 Place all milk ingredients into a saucepan on medium heat until the milk mix is boiling (the milk will curdle due to the acid in the passionfruit, this is fine). Once boiling, remove off heat and leave aside for 15 minutes to infuse and cool. Once cooled remove the orange peel and blitz the milk mix in a food processor until smooth and creamy in consistency. 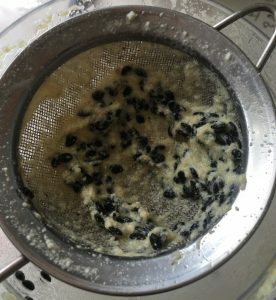 Place the milk mix through a sieve to capture any remaining passionfruit seeds and leave the milk mix aside for later use. Meanwhile, beat the egg yolks, sugar and flour with electric beaters for 10 minutes or until light and fluffy. Slowly pour the milk mix into the egg mix while stirring with a spatula until completely combine. 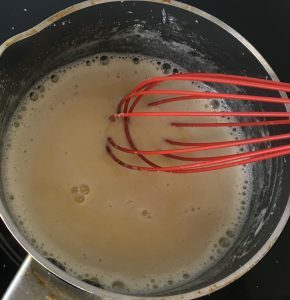 Pour the mix back into the saucepan on a medium heat and whisk with a hand whisk for 10 minutes or the custard is thickened to a curd/aioli consistency. Take off the heat and whisk in the butter until well combined. Pour the custard into 4 glasses and cover with plastic wrap. 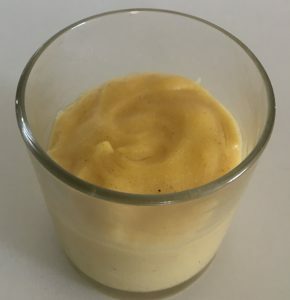 Once the custard is at room temperature place the glasses in the fridge to set for at least an hour. 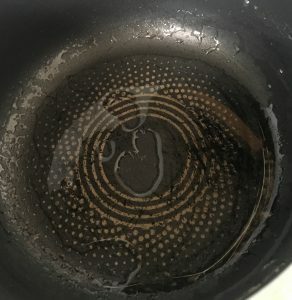 Meanwhile, make the syrup by placing the sugar and juice into a saucepan on medium heat, stirring until sugar has dissolved. Leave the syrup to boil until it thickens to syrup consistency, remove off heat. Allow the syrup to cool before placing it into a container, them into the fridge. When you are ready to serve pour the syrup over the top of the pots evenly and top with pineapple pieces. Tags: custard, orange blossom, passionfruit, Passionfruit Orange Blossom and Pineapple Custard Pots, pineapple, pineapple syrup	. Posted on April 22, 2017 Posted in Cakes	. 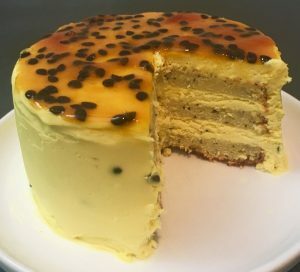 For quite some time now I have been meaning to make a cake with passionfruit. 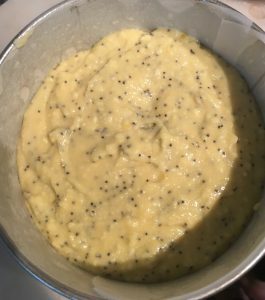 For some reason I always struggle when I bake with this fruit, so I decided to have a passionfruit experimental day of baking. The pairings; passionfruit lemon coconut lime, passionfruit lemon yoghurt and passionfruit orange blossom and vanilla. All cakes were made with the same method just variations to the ingredient flavor pairings. 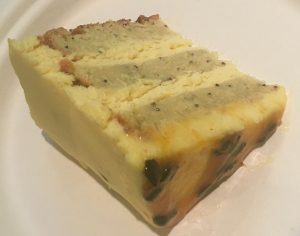 The lime cake – well the learning here is that passionfruit is not the most intense flavor. In fact the passionfruit was overpowered by the citrus flavors to become a soft background unnoticeable aftertone. Don’t get me wrong, this cake was nice but defeated the experimental purpose. The Passionfruit lemon cake was ok as I upped the passionfruit amount in this cake, however the yoghurt didn’t produce the best texture of the cake I was looking for. Lastly, after taking the learnings from the last 2 cakes I opted for the less intense orange blossom for the sweet floral notes instead of strong citrus profile. The vanilla also provided a lovely floral aroma that complimented the blossom but didn’t overtake the passionfruit flavor. 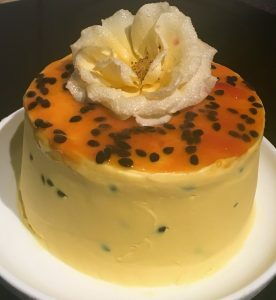 To be honest the only way I could really make the passionfruit flavor shine was to use passionfruit jelly crystals in addition to using actual fruit. Pre-heat the oven to 175c degrees and line a 25cm cake tin with baking paper. Place the butter, jelly crystals and sugar into a bowl and beat with electric beaters for 2 minutes. Add the eggs one at a time, beating in between each addition. Add the vanilla, orange blossom and poppy seeds and beat for 2 minutes. Add half the buttermilk, the passionfruit pulp, the salt and half the flour, stir until just combine. Add the remaining buttermilk and flour and stir until combine. Pour into the cake tin and bake for 1 hour of until a skewer inserted in the center comes out clean. 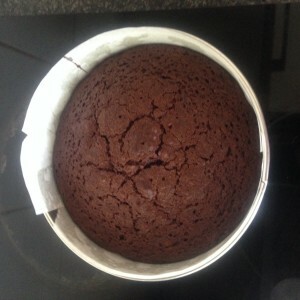 Set the cake aside for 10 minutes then transfer onto a cooling wrap to cool completely. 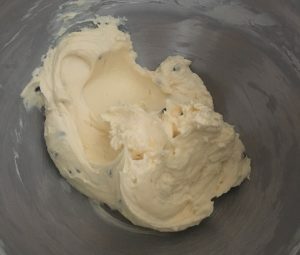 Meanwhile to make the frosting beat the cream with electric beaters until soft peaks form, set aside. Beat the remaining frosting ingredients for 5 minutes until light and fluffy. Add the cream to the cheese mix and beat until just combined. To make the cake, cut the cake horizontally into 3 equal layers. Place one layer onto a plate, spread with ¼ frosting, add a second layer, spread ¼ of the frosting and top with the remaining cake layer. With the remaining frosting top the cake as well as the sides until smooth. Top the cake with the 2 passionfruit’s pulp and enjoy. Tags: orange blossom, passionfruit, Passionfruit Orange Blossom Vanilla Cake, Passionfruit Orange Blossom Vanilla Jelly Cake, vanilla	. Posted on August 31, 2015 Posted in Cakes	. Every now and then I play with vegetables in my recipes. Some favorites have been my Sweet Potato and Orange Cake , Chocolate Zucchini Cake , Beetroot and Chocolate Brownies to name a few; however one vegetable I have not baked with is the plain old fashion potato. Though not very popular at current this mundane ingredient was once a norm for cake baking (especially mid-1900s to late 1900s). I believe the original reason potato featured so heavily in baking (mashed to be more specific) was to use up leftovers. The Irish were quick onto this where they would make savory potato cakes with eggs, flour, butter, onion etc. 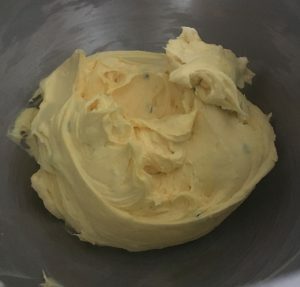 However I am told my grandmother’s sister had a signature potato cake and frequently use this ingredient to make cakes light, fluffy, moist and dense. It is also used to replace flour is some cases (just like apple puree is to replace butter). After a few trials I came up with my own potato cake version, which I am quite proud of as it definitely exceeded my expectations! Think chocolate mud cake, but without the naughty cream and chocolate. 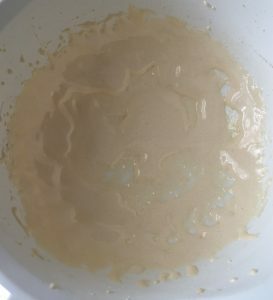 In a bowl cream the butter and sugar with electric beaters for 5 minutes until pale and fluffy. Add the potato and vanilla essence and beat for 1 minute. Add the milk and sift in the flour and cocoa powder, stir with a spoon until just combine. Beat with electric beats for 1 minute. 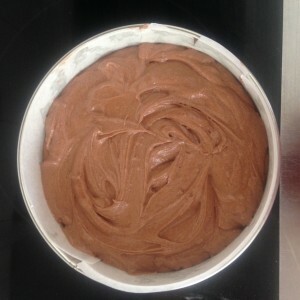 Pour the mix into the cake tin and bake in the oven for 1 hour or until a skewer inserted in the center comes out clean. Allow the cake to cool in the tin for 10 minutes, and then place on a cooling rack until cool. 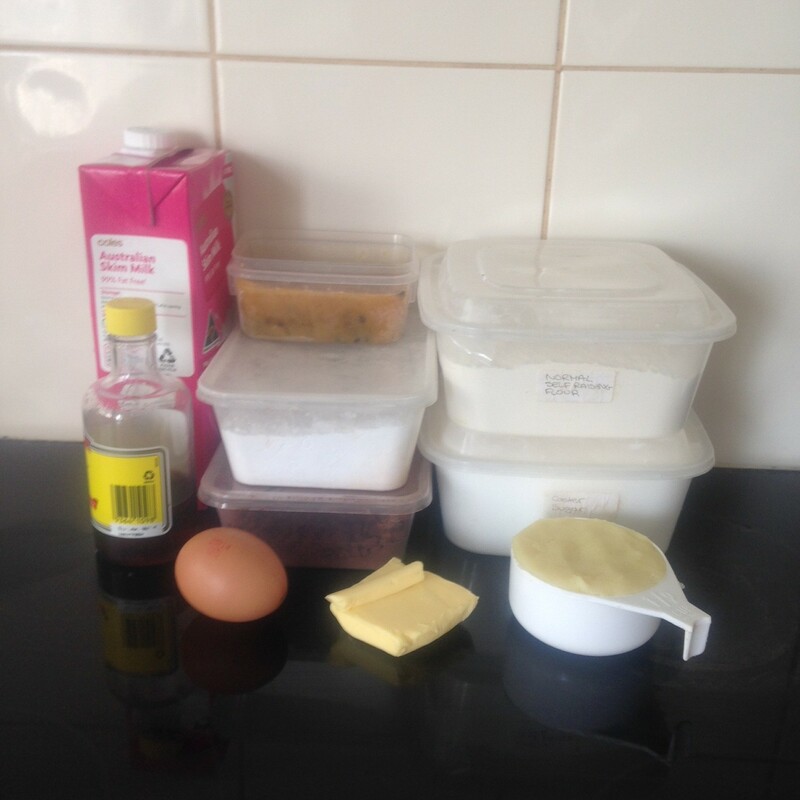 Meanwhile make the icing by whisking the ingredients with a hand whisk until combine. Spread icing on the top of the cooled cake and enjoy. 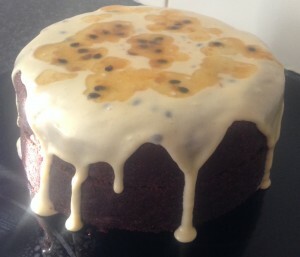 Tags: chocolate, cocoa, mashed potato, passionfruit, Potato Chocolate Cake with Passionfuit Icing	.